A major milestone occurred in our national polling this week: John Boehner is now just as unpopular as Nancy Pelosi. His net approval is -24 at a 28/52 spread and her net approval is -24 as well at a 31/55 spread. In 2010 Republican House challengers were dying to run against Pelosi and did so with a high level of success. Now it looks like Democratic candidates may similarly be able to get traction by running against Boehner next year. Pelosi's numbers now are exactly identical to what they were when we did our first poll of the year in January. But Boehner has dropped by an astounding 31 points. He began the year in positive ground with 35% of voters approving of him and 28% disapproving. Over the course of his first seven months as speaker his approval has dropped 7 points while his disapproval has spiked by 24 points. I think most national pundits continue to be missing the boat on how possible it is that Democrats will retake control of the House next year. We find Democrats with a 7 point lead on the generic Congressional ballot this week at 47-40. After getting demolished with independent voters last year, they now hold a slight 39-36 advantage with them. And in another contrast to 2010 Democratic voters are actually slightly more unified than Republicans, with 83% committed to supporting the party's Congressional candidates compared to 80% in line with theirs. This poll is certainly not an outlier. We have looked at the generic ballot 11 times going back to the beginning of March and Democrats have been ahead every single time, by an average margin of about 4 points. This 7 point advantage is the largest Democrats have had and if there was an election today I'm think that they'd take back the House. Of course there's plenty of time between now and next November for the momentum to shift back in the other direction. There's little doubt that Democrats are winning the fallout of the debt debate. Approval for Congressional Republicans has now plunged to a 25/65 spread. That's a 21 point decline on the margin from when they started the year at 33/52. Last year independent voters were the driving factor behind the GOP retaking the House majority. Now they give it a 20/68 approval rating. It's early- but it looks very plausible that we could be back to Speaker Pelosi 17 months from now. Not likely. Presidential election years don't tend to produce swings as big as those of midterm elections. The Democrats will probably win seats, but probably not enough to retake the House. They probably won't even get more than 50% of the seats they would need for that. One, this is a poll of Registered voters. Obviously it is probably too early to take a poll of likely voters now, but registered voter polls always skew towards Democrats, a point Gallup stressed many times last year. Two, Obama is in serious, serious trouble. I find the notion that people are going to vote against Obama and for the Democrat in the House to be a pretty dicey one, at best. Thirdly, it is way too early to proclaim that Dems can win the House. A lot of this is a reaction to how the debt deal went down. That anger is going to cool down. Fourthly, in proclaiming that the Dems are going to retake the House, totally left out of the discussion is the huge redistricting advantage Republicans will have come 2012. 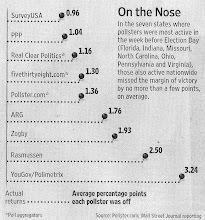 "registered voter polls always skew towards Democrats, a point Gallup stressed many times last year." Not really in presidential years. It was true last year because of the huge enthusiasm gap. "totally left out of the discussion is the huge redistricting advantage Republicans will have come 2012." Why do you say it's huge? So far it's been a wash. I agree with the comments that suggest that DEM disapproval numbers are misleading since they include both people who want the DEMs to be MORE liberal and people who want them to be LESS liberal. Meanwhile, Nobody wants the Repubs to be more liberal. Everyone who disapproves of the Repubs wants them to be even more extreme RW. The notion that Obama is in "serious, serious trouble" is absurd. Who do the Repubs have who could possibly beat Obama? Nobody. They are all light weight fruitcakes, including the official "maybe" candidates like Chris Christie.